When Wanelo CEO Deena Varshavskaya started looking for funding for her startup in mid-2011, talking with investors wasn’t the hard part. It was closing the deal. “It was really easy for me to get meetings, because everyone knew something needed to happen in social commerce,” she said. But signing deals was another story. She was a single entrepreneur with only her younger sister as a fellow employee — a teenage sister who had dropped out of high school to help Varshavskaya build her dream. And eventually, Wanelo’s numbers attracted the attention she was looking for. The company closed its funding round in March 2012, raising $3 million from Floodgate Capital, First Round Capital, Forerunner Ventures, Naval Ravikant and other angels. And since then, the site has become a quiet success among young women, who love the site’s simple format and core proposition: everything on the site is for sale, and it’s filled with products your peers would buy. Wanelo’s growth comes as teenagers are rapidly embracing social media, and large brands like Nordstrom or Zappos are trying to understand how to connect with the next generation of social shoppers. By taking Pinterest’s photo-centric, endless scroll and making it easy to buy products, it’s easy to see why investors and shoppers looking for the future of social shopping have taken note. When you talk with the 33-year-old Varshavskaya, it’s easy to see why someone who had only her younger sister as an employee won over investors from some of Silicon Valley’s top tier firms. Wanelo CEO Deena Varshavskaya in the company’s SOMA offices, showing off her recent Wanelo find — cat-themed leggings. Varshavskaya said she got the idea for Wanelo when she was working in Los Angeles, and she got interested in the experience of social media and how it tied in with product design. She started out paying $20 a day of her own money to advertise Wanelo on Facebook, not in an effort to get Wanelo to go viral, but just to acquire users to test things out and give her feedback. 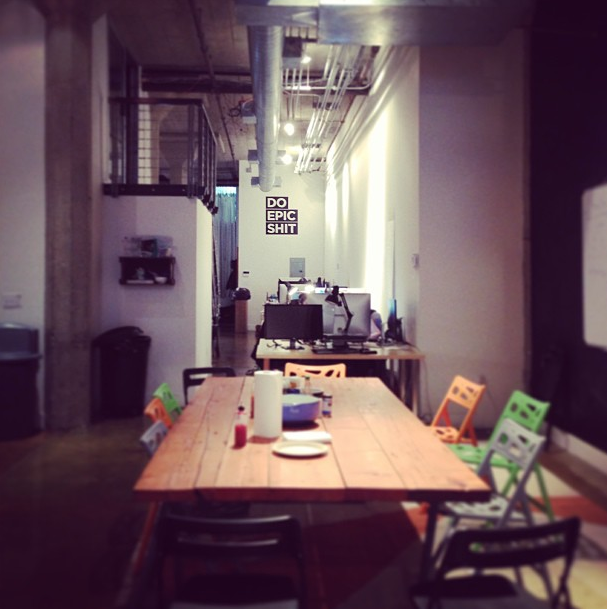 But Wanelo quickly grew beyond a group of early testers, and in early 2011 Varshavskaya moved from Los Angeles to San Francisco to go full-time on the idea. While the company does not release its conversion rates or monthly active users, Varshavskaya told me Wanelo is confident that is has some of the highest conversation rates among the top social media platforms. The company grew from 1 million registered users in November 2012 to 8 million in May 2013, which wouldn’t mean much, except those users spend an average of 50 minutes a day on Wanelo, the company reports. That is a lot of time, especially when you consider people spend about 30 minutes a day on Facebook. 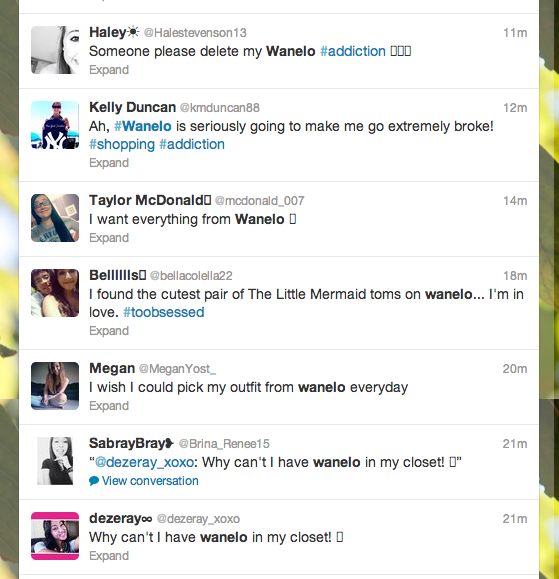 And it’s promising if Wanelo can continue growing at that existing rate. As I’ve written before, one of the biggest hurdles for Wanelo will be proving that it provides enough value apart from Pinterest, its most obvious competitor. Both sites provide a grid of photos that you can like and re-post, allow users to follow other people in an asynchronous manner like Twitter, and attract a strong female demographic. But there, the two diverge. When I look at my Pinterest page, it’s filled with a lot of different types of photos: recipes, clothes, artwork, architecture, design, book covers, furniture and kitchen utensils, the outdoors, and my favorite board, dogs. Probably only 30 percent of the photos I save on Pinterest link to anything you could actually buy. And while Pinterest is working to fix that problem, and has a lot of venture funding to do so, the site that’s grown to massive proportions around aspirational images still has a ways to go. In contrast, 100 percent of the items on Wanelo are available for purchase, unless they’ve recently sold out. It’s an endless feed of items for sale. Users even complain when items aren’t available. Just this week, the lifestyle media company Brit + Co. raised $6.3 million from investors, which prompted some understandable mocking from people who couldn’t see past her popcicle stick necklaces and DIY-themed crafts. But as Ryan Tate pointed out on Wired, Morin has successfully capitalized on a growing movement among young women who want to discover products on their own, and for whom glossy marketing in fashion magazines is no longer relevant. Traditional retail experiences like visiting a shopping mall with friends, or buying a fashion magazine from a newstand, are no longer part of the future. So how do brands stay relevant at a time when mall browsing is going out of Vogue, and new social media sites like Wanelo are cropping up all the time? In some ways, they shouldn’t think of it any differently than how media companies are thinking about content, Varshavskaya said. Users are going to share your items everywhere, and the brands that make it easier will be the ones that suceed.